China successfully launched its first space lab module into orbit in an impressive nighttime display today (Sept. 29). The unmanned Tiangong 1 module lifted off on a Chinese Long March 2F rocket at 9:16 p.m. Local Time (1316 GMT/9:16 a.m. EDT) from the Jiuquan Satellite Launch Center in northwest China. The spacecraft launched just days before China's National Day holiday, which occurs Saturday (Oct. 1). "They're doing their version of Spacelab, but that's something we did back in the '70s," she said. The Tiangong 1 module, which is expected to remain in orbit for two years, is considered an important steppingstone in the country's effort to construct its own crewed space station. The prototype space lab measures 34 feet (10.4 meters) long and 11 feet (3.35 meters) wide and weighed about 8.5 metric tons on Earth. Tiangong 1, which translates to "Heavenly Palace," will test docking technology in conjunction with three spacecraft — Shenzhou 8, Shenzhou 9 and Shenzhou 10 — that will be launched at a later date, according to state media reports. These planned robotic maneuvers will be China's first dockings in orbit. The Shenzhou 8 spacecraft will launch in early November, with Shenzhou 9 to follow in 2012. Both flights will be unmanned docking trials. The Shenzhou 10 mission, also in 2012, may carry a crew to Tiangong 1, a team that could also include China's first female astronaut, Chinese space officials said. Tiangong 1 is also carrying medical and engineering experiments into space, according to state media. It is packed with 300 flags from the International Astronautical Federation, to commemorate the mission. While Chinese space officials have indicated that the launch of Shenzhou 8 could occur in early November, but it's possible the unmanned mission could lift off sooner, said Dean Cheng, a research fellow on Chinese political and security affairs at the Heritage Foundation, a conservative public policy think tank. 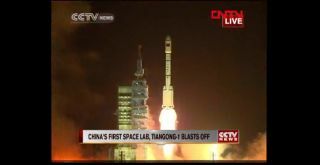 "The Chinese have put up launches within days of each other," Cheng told SPACE.com. "But we don’t have a good indication as to exactly when it will go up." "It’s probably going to be a big deal in China, with lots of news coverage," Cheng said. "You’d probably have to make an effort to avoid it. Once this is launched, you are going to have just a huge amount of hoopla from the state-run media to remind the people of what is going on." You can follow SPACE.com staff writer Denise Chow on Twitter @denisechow. SPACE.com senior writer Clara Moskowitz (@ClaraMoskowitz) contributed to this report. Follow SPACE.com for the latest in space science and exploration news on Twitter @Spacedotcom and on Facebook.